With the advent of globalization, the demand for proficient foreign language transcription and translation services is growing, which in turn has increased the demand for outsourcing foreign language transcription and translation services. Although English, Spanish and French are the most popular and commonly spoken and written languages in the western world, many countries have found the need to convert their business-critical information to other leading languages for better reach and visibility. If your organization requires expert foreign language transcription or translation services, Outsource2india can help! We are pioneers in providing technology-driven translation and transcription solutions to global companies and have an in-depth experience in the field. Our certified language professionals can flawlessly transcribe and translate your documents, interviews, seminars, web content etc., from over 30 plus Asian, European, Mid-Eastern languages to English and vice versa. If you are looking to outsource foreign language transcription and translation services, Outsource2india offers accurate, on-time, high-quality, and cost-effective services. Bilingual Transcription Services - Outsource2india offers transcription in multiple languages with high level of accuracy and quick turnaround time. This helps give our customers a real competitive advantage. We can provide you with a dedicated team of bilingual transcriptionists who offer flexible solutions to meet all your business requirements. French Transcription and Translation Services - At Outsource2india, we have French transcription and translation professionals who can seamlessly transcribe all your business-critical information from French to English. Our certified French transcription and translation professionals are fluent in grammar, punctuation, spelling and sentence structure of both French and English languages. With our fluency in these languages, we can provide accurate and error-free French translation services. We provide a dedicated team who can understand your business requirements and efficiently meet your needs. Spanish Transcription and Translation Services - We have certified Spanish transcription and translation professionals who are well-versed in both the Spanish and English languages. Our Spanish transcription team is fluent in grammar, punctuation, spelling and sentence structure of both Spanish and English languages. This fluency in enables us to accurately translate different types of Spanish documents. With our experience, we can seamlessly transcribe and translate your business documents, web content, interviews, discussions, conferences and classes into English. Corporate Videos Transcription and Translation Services - At Outsource2india, we carry out regular transcription and translation services for corporate videos. We conduct pre-transcription Audio/Video Assessment which adds clarity to the progress of the project. O2I can handle a wide variety of prepare subjects, right from business and legal to more intense engineering and life sciences. Our team of transcription and translation professional maintain a high level of quality and are supported by language and subject matter experts. As part of transcription and translation services we can also include Timestamps, Speaker identification, Customizable Transcript formatting etc. Outsource2india has been working in the translation and transcription domain for over 20 years. O2I's team is dedicated to just one premise - to present accurate translation and transcription services through precise interpretation of data. Every transcript and translation from O2I undergoes thorough proofreading and editing with additional time spent on researching and perfecting the scripts. Backed by a strong network of trusted foreign language transcriptionists with native language expertise, O2I translates and transcribes from any source - audio, video, or digital at highly cost-effective price. At O2I we have a team with expertise and domain knowledge across various fields to match diverse business needs. Our team has decades of practical experience with special understanding and background to navigate through the most hard-to-translate documents. As part of our professional transcription and translation services, we use native speakers who understand the finer nuances of the language. Using the latest transcription and translation services technology it supports accuracy, consistency and speed. 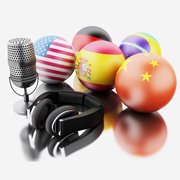 Want to know more about our wide foreign language transcription and translation services? Just fill in our inquiry form and our Customer Engagement team will get in touch with you within the next 24 hours.